The rumor that will never die. Not only is Tim Cook’s crew is working on a television, the rumor mill has upped the stakes and is now saying it will be an ultra HD 4K Apple iTV — we will be able to count the hairs on a fly’s backside. Take that, Samsung. Boom — Apple winning. Citing unnamed supply chain sources, DigiTimes claims Apple is trying to source ultra HD 4K panels (3840 x 2160 pixels) for a television that could arrive on your living room wall in time for Christmas 2013. …Apple and Foxconn Electronics have been in discussions for quite some time in terms of the TV’s mass production schedule, but that Apple has been considering where panel supply for the TV will come from… [S]ources added that Apple is banking on LG Display to be able to mass produce Ultra HD TV panels by… the end of 2013 but is more likely to do so towards the beginning of 2014. And, that my friends is the sucker punch, a more exciting 2013 ship date that many are running as their headline, but a more likely 2014 reality tagged on at the end. 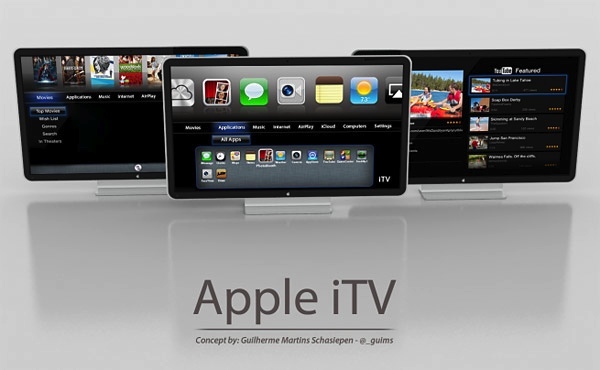 Further according to DigiTimes’ supply chain sources, the Apple iTV will feature voice and motion control functions, as well as Internet connectivity. More pixels than the human eye can perceive and the latest “me, too” (done right) features? Plausible enough, I guess. In all likelihood, Apple has created and perfected multiple high-end televisions over the years — Tim Cook, Jony Ive, Bob Mansfield et al are more than capable and Steve Jobs did say before he died that he had nailed the concept.